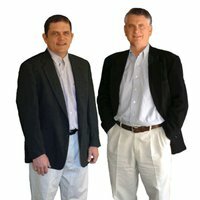 While we feel strongly about the need for affordable housing in the U.S., and that the role of the mobile home park is to provide housing for America’s working poor, there is a whole different camp of mobile home park owners who believe in a business model called “lifestyle choice” – the thought being that folks earning $50,000 per year and who can afford a traditional brick home will choose the mobile home because of its carefree, low-maintenance lifestyle. While we’ve always considered those operators to be nuts, recent changes in the Dodd-Frank laws on mortgages are finally going to drive a stake in the heart of the “lifestyle choice” fanatics. And while they go down in flames, it’s important to remember that, of the 50,000 mobile home parks in the U.S., only roughly 1,000 of those use a “lifestyle choice” business model. The industry has always been about affordable housing. It always will be. But that’s what natural selection is all about; the strong buy more parks and the weak get eaten by the tiger. Watch for plenty of articles on the “lifestyle choice” debacle in the months ahead. Virtually every industry has a museum of some type – so why not mobile homes? Still, the scale of the MH/RV Museum and Hall of Fame in Elkhart, Indiana was much more impressive than I expected. You might expect a mobile home museum to be in an abandoned Sears store in a blighted neighborhood, but this is a multi-million structure right next to a highway. The museum is set up in three exhibit areas. One is strictly for new RVs (probably to try and interest you enough to buy one). 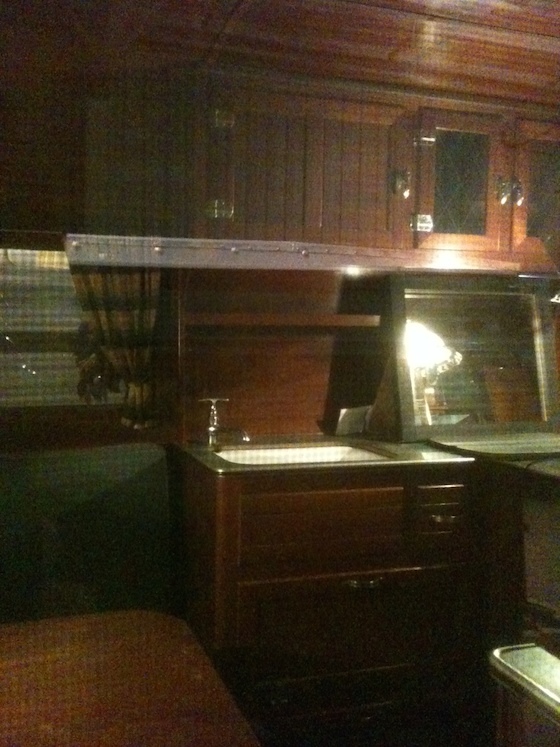 Another section offers exhibits of mobile home and RV products (probably the sponsors of the museum for that year). 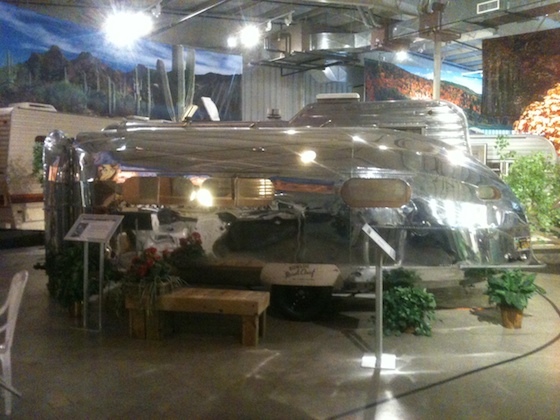 But the main attraction is the giant gallery of RVs from their earliest invention to the birth of the mobile home. It’s in the form of a rambling path with backgrounds and decorations of each period. 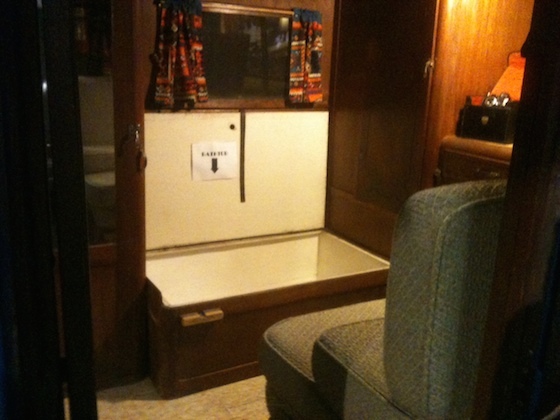 The first production travel trailer in the United States was the “Covered Wagon”, introduced in 1929. The company went public in 1937 on the NYSE, but was out of business by 1941. Did World War II end it, or did people get tired of explaining what the heck it was? Regardless, this is the Grandfather of all mobile homes. By 1935, the designs had improved significantly. 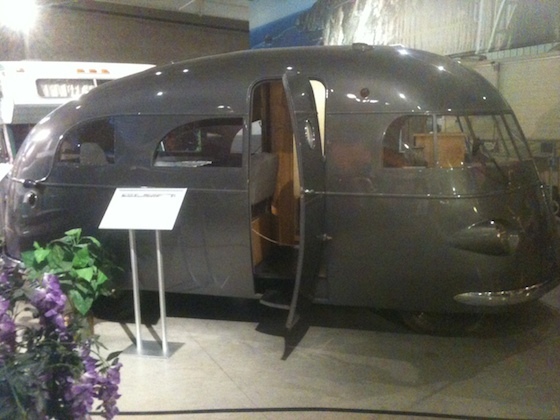 The “Bowlus Road Chief” is one of the most interesting RVs in the museum, showing some extremely advanced design elements, such as the aluminum exterior. 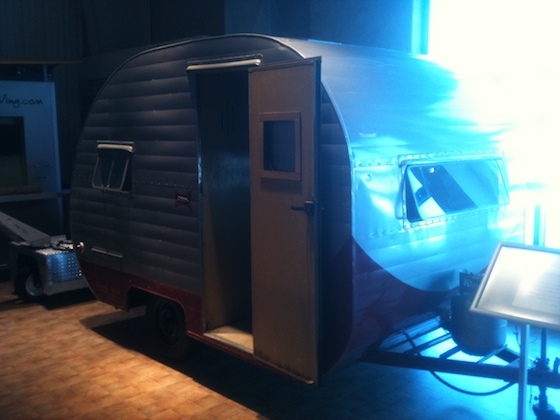 This design, by Hawley Bowlus, is credited as the origin of the Airstream trailer that is still manufactured today. 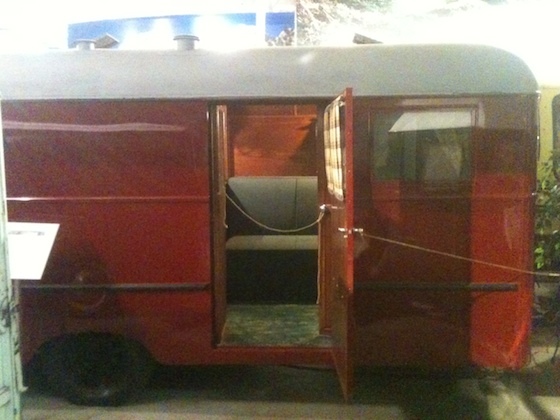 The 1937 “Hunt Housecar” was another advance, as it is no longer a trailer but an actual motorhome. It was designed and built by Hollywood producer Roy Hunt. It’s stylish design uses Bowlus’ aluminum exterior, and includes an interior that looks like something from a comic book. This is where the MH and RV , in my opinion, begin to go down different paths. 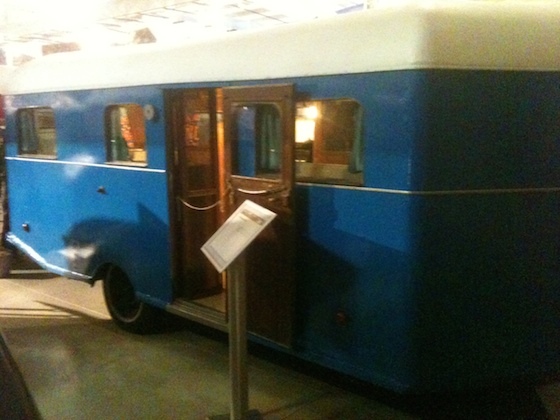 By comparison, here’s the 1936 Roadhome Coach. 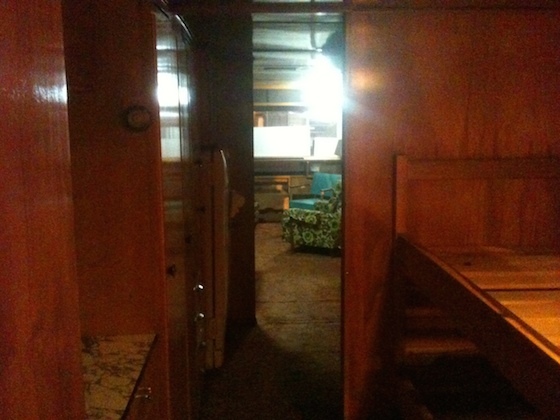 Built in Los Angeles, with Masonite exterior, this is obviously much more spartan than the Housecar, and was intended for actual living. 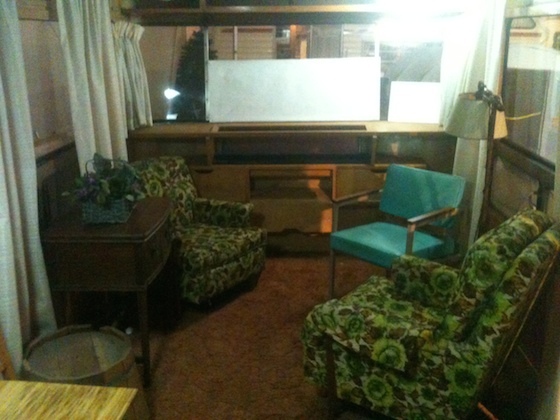 I have been in many older mobile homes that greatly resemble this interior. 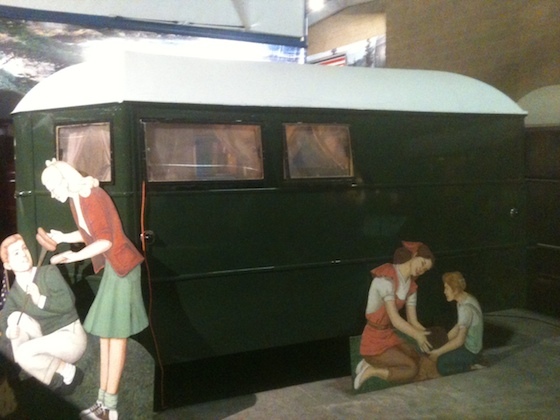 The 1937 Hayes Motor Home also resembles the mobile homes of the 1950’s. Note the expensive carpentry and quality woods in the interior. This was designed for the option of permanent living, and I’m sure that many a family in the depression lived for years in it. 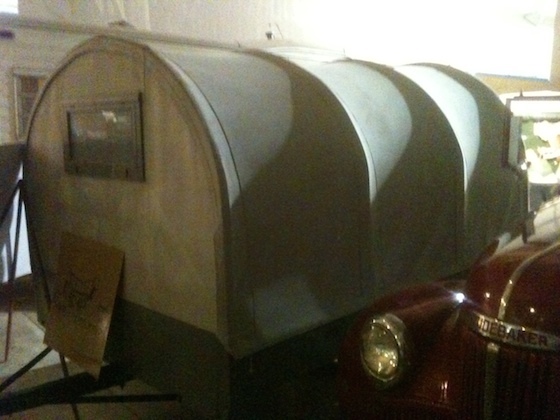 By 1939, the DNA of mobile homes was written all over this unit, the Schult 8’ x 20’ House Trailer. 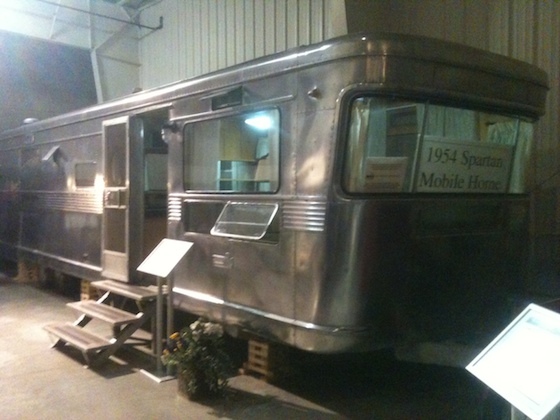 Note that Schult is still a manufacturer of mobile homes – that’s an unbelievably long run for a mobile home manufacturer (I think the longest in the museum). Schult builds good quality homes today, and this one, although bare-bones, looks very solid. This 1950 Fleetwood was the first model that Fleetwood ever built. Of course, Fleetwood, now a part of CAVCO, is one of the largest mobile home manufacturers in the U.S. 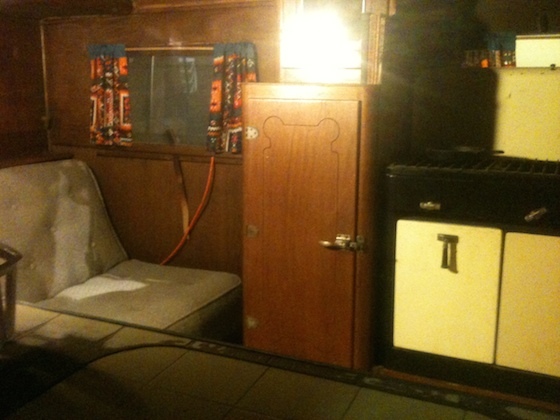 But back in 1950, the plan was to build simple, small travel trailers. 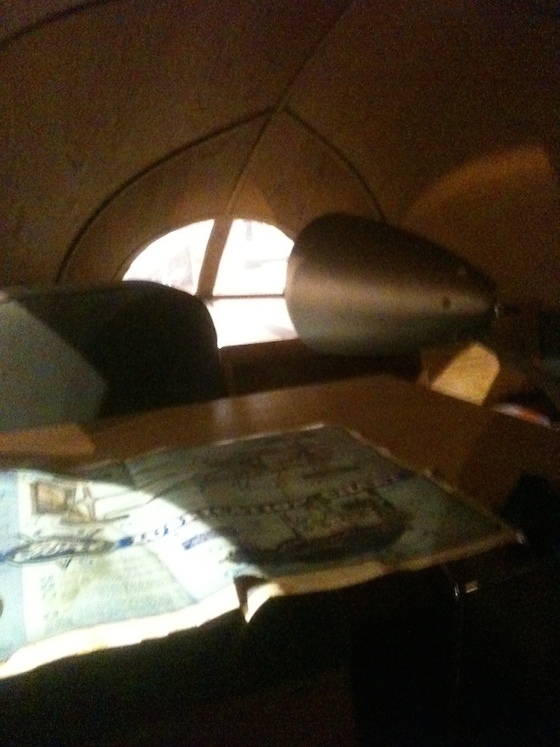 And that brings us up to the most modern mobile home in the MH Museum. And that’s the remarkable 1954 Spartan Imperial Mansion, an 8’ x 42’ mobile home, and, in my opinion, the forefather of the modern mobile home industry. These mobile homes were built by the Spartan Aircraft Company in Tulsa after World War II, using the aluminum stock left from warplanes. They were the finest mobile homes in existence in the 1950’s, and were built as permanent residences. For those who have read J. Paul Getty’s biography, these mobile homes were Getty’s brainstorm to keep the aircraft factory alive after the end of World War II. He made an outstanding design, and the production quality was unequalled – the exteriors were sealed just like the planes, so they were completely water tight. The museum also offers various exhibition cases of model mobile homes and RVs, an exhibit on historical mobile home photos, and a gift shop. I noticed on the sponsorship plaque that three individuals had donated over $1 million to build the museum – with one person giving over $2 million. I had no idea that a mobile home and RV museum would garner that much support. If you are ever in Indiana, you should drop by and take a look. The mobile home park industry is a story of evolution. Virtually every other real estate asset class is in a modified form of the original purpose. However, mobile home parks began life as RV parks, and were intended for temporary housing. Their adaptive use as full-time living began at least a decade after they were originally introduced. And the first “mobile home” – a structure that could only be transported with a special use permit – did not arrive on the scene until the 1950’s, and signaled the division between “mobile homes” and “RVs”. So has the industry’s evolution ended? We don’t think so. We think that the final evolution is occurring right now; the separation of the two basic mobile home park business models of affordable housing vs. lifestyle choice. And we think that there will be big losers and big winners ahead, based on which path you follow. Although RV parks have always catered to the prosperous, those that reside in mobile home parks have always been part of a lower demographic. The first full-time mobile home park tenants came about during the Great Depression – and they were not “in the money”. Mobile homes represented basic shelter at its cheapest, yet with the dignity of privacy, a yard, and a community feel. That remains the sweet spot of the industry: basic shelter for the working poor. To this segment of the population – those who earn minimum wage to around $15 per hour – mobile homes represent their only shot at the American Dream of home ownership. With 20% of American households earning $20,000 per year or less, and 10,000 baby boomers retiring per day into an average social security check of $14,400 per year. As the U.S. economy declines, the demand for affordable housing – which is defined by us as total home payment and lot rent under $500 per month -- goes up exponentially. Clearly, this is the path that all mobile home park owners should take: housing the poor. The alternative to affordable housing is called “lifestyle choice”. The concept is that consumers will live in mobile home parks by choice and not by economic necessity. The theory is that the average American will be drawn to the rustic feel and like the no-nonsense tiny yard and lack of upkeep required. We’re not sure who dreamed this fantasy up, but it would be like proposing that the average American – with price being no object – will stay at a 1-star hotel over a 5-star because he likes the gritty, broken furniture, wildlife under the bed, and towels that have interesting designs of stains on them. So how did this failed logic ever develop into a business model? Good question. The real culprit were the financial markets, as the first mobile home park REITs and wannabe REITs felt that they had to offer a glossy image to attract investors, and wanted to be like their rich brother, the apartment industry. So they designed a mobile home park product that was not based on actual demand, but simply appearance. They kicked out the old, ugly homes (although those were paid for) and brought in brand new homes that saddled the customers with $1,000 to $1,500 monthly payments, including lot rent. Then, working backwards on the economics of the monster they had created, they had to convince investors that people who earn three times the monthly total -- $40,000 to $60,000 per year – have an interest in living in a trailer park. Their spin doctors were only able to come up with a couple explanations (neither being valid) that mobile home parks offer a carefree lifestyle and a chance to commune with nature. At the MH/RV Museum (described in this issue) there is a display of testimonials on the industry. One of them is a couple who claim that they prefer their mobile home to their former $300,000 custom home because it is so low maintenance. Well, I guess the one-star hotel is low maintenance, too, because you just throw the trash on the floor, since it’s already a dump. But let’s be honest; this is the dumbest business model ever engineered. Yet our three public mobile home park REITs in the U.S. have all chosen this as their master plan. People were already starting to see through the lifestyle choice charade in 2013, with an article in the Wall Street Journal that suggested that the lifestyle choice business model does not work and using the performance of SUN and UMH (two of the three public REITs) as Exhibit A. But the real death to the model is going to start this year, and comes in the form of the new Dodd Frank laws on mortgages and mobile homes. 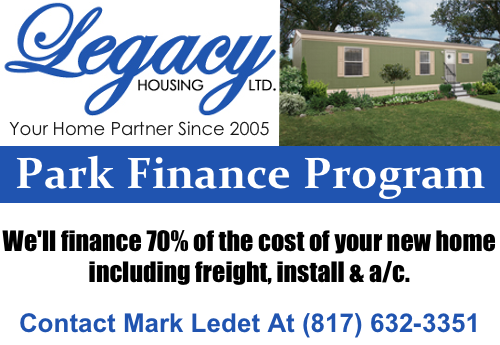 Based on the Dodd Frank laws, a recent industry estimate is that only 50% of the customers who were underwritten last year for conventional mobile home mortgages would qualify under the new rules. Since the lifestyle choice model is centered around these “conventional” mortgage customers, that means that already anemic sales will only get significantly worse. Why is “affordable housing” insulated? Because our customers know better than to seek real mortgages, instead buying cheap homes for cash or renting mobile homes. We would not group Equity Lifestyle (the largest of the three mobile home park REITs) as a pure “lifestyle choice” company. They have significant holdings in RV parks – maybe half of their 160,000 lots – and Sam Zell is a very smart businessman, who has concentrated the portfolio in Florida and other markets in which “affordable housing” and $1,000 per month are not incompatible. The collapse of the “lifestyle choice” model will initially have some adverse effects on the industry. Since the three public REITs engage in that model, it will get a ton of press. But, at the same time, reporters will start to realize that, of the 50,000 mobile home parks in the U.S., less than 1,000 are lifestyle choice. And this awakening of the media will yield more articles on the business model that does work. You should also watch for further problems in the mobile home manufacturing and retail side of the industry. Sales are already bad at 60,000 units per year, so you can imagine the carnage at 30,000 units. But again, this will have no impact on the affordable housing segment. Dave and Frank both realized early on, with their first parks, that affordable housing was the key to success in mobile home parks. It’s the formula that all successful operators have stuck with. Those who ate the forbidden fruit of lifestyle choice are going to perish. It’s just a matter time.